In late June ’18, my wife, Claire, and I have been happily married for almost 50 years. We have 3 daughters, 3 sons-in-law, 7 grandsons and 1 great grandson. Family is important to us! We’ve both been shaped by our upbringings in small Texas towns, and by our faith in Jesus Christ. We’ve owned homes in Buda (almost 2 years now) and in SW Austin (the prior 14 years). Before I became a REALTOR®, I was an engineer and manager for 2 companies, and grew my problem-solving and project-handling skills. As a Pastor for 23 years, I developed a Servant’s heart and genuine love for people. These experiences have shaped my work in real estate. Licensed in mid-2005, my focus is homes & neighborhoods in Buda and Kyle. I have helped clients in many locations across the Austin area. My work includes selling homes for clients, and helping them find new or resale homes. I aim to communicate well with them, educate them, and provide them with sound transaction guidance. As your real estate partner, I will go “the second mile” in serving you. I would like the chance to earn your trust and your business! “It is a pleasure to work with Jim Gilbert as realtor for any individual or family searching for the ideal home for their unique situation. We were first time home buyers who had been renting for several years and were ready to make the move to purchase our own home. We are expecting our first baby girl in June and moving in my father-in-law with us. We needed a larger home and were looking to find a home and move quickly! Jim had an initial meeting with us and paid close attention to our needs and wants in a single family home as well as our budgetary limitations. He made excellent use of the relevant search engines and real estate databases to quickly find us a variety of homes for sale. We never wasted our time with homes that were out of our price range or not in line with our needs. Once we found our dream home, together we discussed a deal that was good for us and made the seller happy as well. We were extremely pleased with the timing, especially in the current market situation. He knows southwest Austin like the back of his hand. 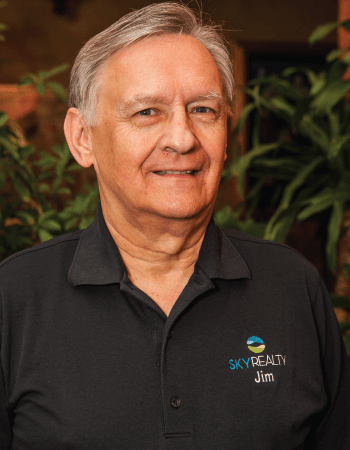 There is nothing that escapes Jim’s attention when it comes to property for sale in this area, including but not limited to school districts, market prices, builders, future land plans. We found Jim to be a highly attentive agent, almost as if we were the only customers, although we know that was not the case. He returned all phone calls and emails the same day. We never felt neglected or unimportant. Jim was always very honest and upfront and all his advice was very useful. “We are writing to recommend Jim & Claire Gilbert as realtor and assistant with Sky Realty. We met the Gilberts a year ago while shopping online for a realtor to sell our home. They called back and came to our home to introduce themselves. They provided us with their personal history and how they came to be realtor & assistant. They emphasized their work ethics which included honesty and integrity when it comes to working for their clients. They provided us with valuable information on what to do to get our home ready to sell. They understood our terms in needing time to complete repairs. They kept in touch with us throughout the year and when all work was completed they were the first we called to see the finished product. They paid attention to detail of what we spent on the updates, and provided us with effective information on what updated homes were selling for in our neighborhood. We sat down and came up with a marketing plan and listed the home. Our home sold in an amazing 14 days and closed 30 days later. Jim & Claire were always available if it were a phone call, text message, e-mail, or coming over to let us in the house when we were locked out. They always communicated effectively with all parties involved. We felt like we were their most important clients which they were with us each step of the way to the very end. Jim and Claire went above and beyond our expectations of realtor & assistant and are confident they display this professionalism to all of their clients. “I have known Jim and Claire for eight years and have worked with them on two home transactions. They are truly heaven sent as our Realtor, Guardian Angels, and Life-long Friends. Always giving 110%, they have a work ethic unlike many that we have known in the past and wholeheartedly have your best interest in mind. In the past and the present, we take great pride in always recommending them first to prospective Clients.